The best magicians of the 21st century set out on a journey to search for the lost author of the most mysterious book on the art of sleight of hand. Interessante film su S. W. Erdnase, uno pseudonimo usato nel 1902 da un ancora ignoto scrittore per scrivere il libro “The Expert at the Card Table” (in italiano “L’esperto al tavolo da gioco“) considerato da molti come il libro più importante in assoluto sulla Cartomagia e le tecniche per barare al gioco d’azzardo. Il film è in un formato particolare, parte documentario dove si parla ai giorni attuali delle possibili ipotesi ed informazioni su chi sia potuto essere S.W. Erdnase, e parte film storico con la ricostruzione di quella che avrebbe potuto essere la vita del fantomatico personaggio, seguendo quello che i testimoni ci hanno lasciato detto. E’ prodotto dalla Fourmat Film GmbH, casa di produzione tedesca, diretto da Hans-Joachim Brucherseifer, con Florian Beyer, Alfonso Rituerto. Advantage Play | Scene from Looking for Erdnase (2019) from Hans-Joachim Brucherseifer on Vimeo. I spent seven years of my life learning magic tricks from a book which is known as the bible of card magic. It was first published in 1902. Today it is regarded as one of the most important treasures of knowledge in the world of magic. From day one I was eager to find out more about the mind behind this book. When I passed the entry test for the Magic Circle of Germany at the age of 19 I started looking for information about the author. However, until today his identity has remained unclear. Through my research I became aware of many fascinating stories connected to the subject. They are the core of this documentary and are all based on true events. S.W. Erdnase… The pseudonym of the most notorious hustler of the 19th century. Today his book “The Expert at The Card Table” is known as the bible of card magic. It is a must-read for every magician. The value of the document was not recognised until 30 years after its release – too late for the author to witness the success of his work and too late for every slight-of-hand artist who would have liked to get to know him. His true identity is still unknown and makes for a mystery which leaves even the best illusionists in the dark. The greatest magicians of the present set out on a journey to search for the lost genius. They report on his alleged suicide and tell stories that make your blood run cold. There seems to be no proof for any of the countless myths and legends surrounding the writer but the search makes one realise the true value of his work. Furthermore, insights into the history of advantage play are provided. They show the origin of some of the best guarded secrets of modern wizardry. The film takes place in two different time periods. While the present-day search for Erdnase is shown in a documentary style, all flashbacks to the beginning of the 20th century are staged and scripted end to end. Archive footage will be used in moderation. The combination of Cinéma Vérité with elements of a heist-drama is especially highlighted on a visual level. The style of all scenes from the past is defined by high contrast images with a 16mm-film look. In contrast to that, all interviews and documentary sequences share the characteristically clean image of a digital camera. Since the audience should not get the impression that any illusions in the film are created with a computer, CGI is used as little as possible. Almost every effect which is necessary to visualise the story is created on set. Furthermore, great attention is payed to the historical accuracy of all reenacted scenes. Beside the predominantly informative aspect of the film, cutting back and forth between the lines of action of the protagonists, creates tension. 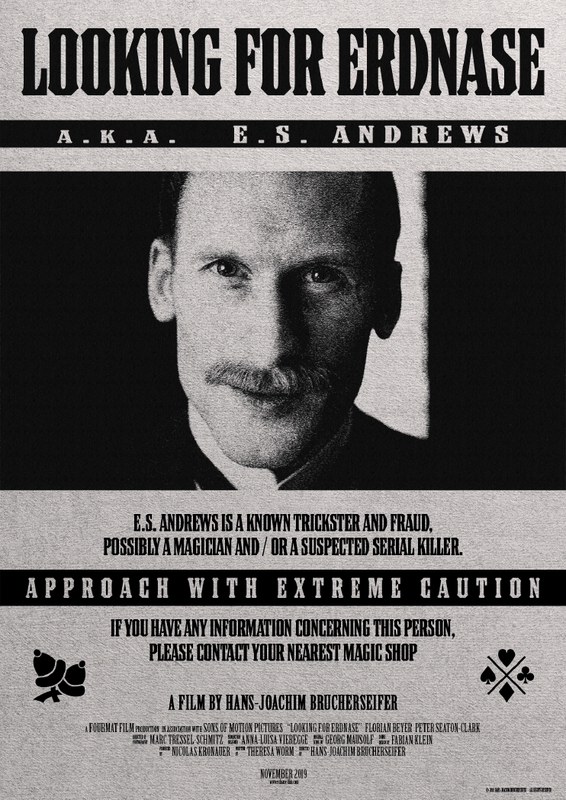 Erdnase is shown in his full appearance throughout the film but his demeanour does not reveal anything about him. His character is built up like a magic trick. He is the German champion of mentalism and a professional actor. Studying illusions for more than 20 years lead him to a point where he no longer relies on rabbits, ropes and ribbons of silk. His weapon of choice is the mind of the spectator. In his shows he controls the attention of the audience so cunningly that it seems as if he knew the thoughts of everybody around him. The only tool he uses from time to time is a deck of playing cards. Joining the German Magic Circle has enabled him to perform internationally and on TV. His exceptional skills on stage prove equally impressive in front of the camera.